Anoriath, a Bosmer scout, owns a vendor stall and is the part-owner of the Drunken Huntsman with Elrindir. He played a part in the amusing tale of how the shop got its name, although only his brother is willing to tell the tale. He is one of the targets of a Dark Brotherhood assassination contract. From 8am to 7pm, Anoriath operates a butcher's stall in Whiterun's market area, selling many types of meat. He then closes the stall to sleep in the Drunken Huntsman. Anoriath wears a set of farm clothes with a pair of hide bracers and a pair of hide boots. He is equipped with an iron dagger and a hunting bow supplemented with twenty iron arrows. He carries a selection of common loot and gold. Upon greeting him, he will say, "Do you hunt? The plains outside Whiterun are ripe with game." When he is running his stall, he will also advertise his goods to passersby, saying, "The finest cuts, fresh from the wilds! ", "Chops and steaks fit for a jarl! Come and see my selection of finest-quality meats! ", or "Tired of bread and stew? Had enough of fish and fowl? Treat yourself and your kin to a choice cut of steak or a tender rack of ribs!" Talking to him there will have him claim, "You should try the venison. It's delicious." When you end conversation with him, he will wish you, "Good hunting." or instead say, "Right. Till next time." If you meet him at the Drunken Huntsman, he will tell you, "Need something? Talk to my brother, Elrindir." or "Remember, I've got the freshest meat in all of Whiterun." While Anoriath is at his stall, you may ask him if he kills all this game himself. He will reply, "Oh, yes. Hunting is my great passion. That's why my brother and I opened a shop to sell hunting supplies. It's the Drunken Huntsman, down by the main gate. He tends the store, and I've got this stall." Should you ask, Elrindir will reveal how he and Anoriath came up with the name "Drunken Huntsman": "Yes, I hear that question often. My brother Anoriath and I came up with it one night after consuming... rather too much mead. After our drinks, we went out for a moonlight hunt. We got separated, and in his drunken state my brother mistook me for a deer. He shot an arrow that pierced my... well, my rump. After such a memorable adventure, we knew we had the name for our shop." "I am the predator. You are my prey." "Only cowards hunt animals. True game walks on two legs." If he walks away, attempting conversation with him will only have him say, "I find your presence... unnerving. Please depart." Anoriath: "I've been thinking of hunting out beyond the boundaries of Whiterun hold." Elrindir: "Again? You just had an "extended hunt" last month. To the Pine Forest, wasn't it." Anoriath: "That was three days. I'm thinking more like three weeks." Elrindir: "Three weeks? You're mad! You can't keep the stand closed for that long!" Anoriath: "Why not? Business has been terrible. Most folk would rather hunt their own meat than buy ours." Elrindir: "Nonsense. That's just an excuse for you to avoid working, and "commune with the greenwood like our fathers of old" and blah blah." Anoriath: "Congratulations, brother. 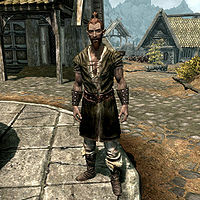 You've been living in Skyrim so long, you've become a Nord." Elrindir: "At least the Nords don't shirk their responsibilities." Elrindir: "Our stock of arrows is running a bit low." Anoriath: "All right. I'll fletch some more when I get the time." Elrindir: "Good. I'll do the same. We've still got plenty of shafts from that Riverwood shipment." Anoriath: "It's been two months, and no word from father." Elrindir: "Don't worry, brother. I'm sure he's fine. We've waited longer before receiving a letter." Anoriath: "Might be worth riding out to Solitude, see if a messenger ship's come in." Elrindir: "If it'll put your mind at ease, then I agree. But not now, all right? We need the business from the stand." Nazeem: "Do you have anything even remotely fresh?" Anoriath: "I can assure you, it's all fresh. I hunt the game myself, every day." Nazeem: "Hmm. As you say." Anoriath: "Maybe you'd like to try the horker? Or some beef?" Nazeem: "You don't prepare the meat with any of those strange Elven spices, do you?" Anoriath: "Ahhhh... No, no Elven spices. Just some salt, to preserve it. You're not afraid of salt, are you?" 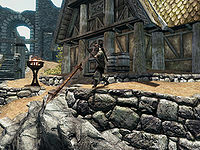 Nazeem: "I'm not "afraid" of anything. I simply prefer quality merchandise. No, no this meat won't do at all. Too much fat, and it all smells... wrong." Anoriath: "Suit yourself, then. The woods are that way. Outside the walls, walk straight ahead. Can't miss them. Good luck on your hunt." Anoriath has the investment dialogue, allowing you to pay him 500 gold to invest in his store. However, investing in him has no actual effect—his gold is not permanently increased because his merchant chest does not contain the PerkInvestorStoreUpgrade bonus gold. This issue has been addressed by version 2.0.4 of the Unofficial Skyrim Patch; he can no longer be invested in. Anoriath was supposed to hunt deer outside of Whiterun. Dialogue was even recorded for this: "Oh! You startled me. I wasn't expecting company out here." and "Shhh. You'll scare the deer." However, the dialogue has been deliberately blocked from being accessed and Anoriath has no AI packages that take him outside of the city, despite Nazir's Dark Brotherhood contract specifying you could kill him while hunting and not incur a bounty. This issue has been addressed by version 2.0.5 of the Unofficial Skyrim Patch; it was fixed, but the fix made Anoriath "psychotic" and was reverted in version 2.0.5a.